In working out the details of my Family Cookbook there were several real challenges. I wanted at least one page from each of my father’s siblings. His oldest sister, however, was someone I never really knew all that well. Generationally our families were not in sync. That aunt was quite a bit older than my father and her children were a lot older than me. By the time I became interested in cooking they had all moved far away. I tried to think of a recipe that would somehow fit. I had been to her house many times as a small child. She held an annual family Christmas party in her basement before my uncle retired and they moved to Florida. There was lots of food there. The problem was I couldn’t really remember any of it very well. At the time it didn't really appeal to me. I was still little then and all my memory could conjure up was a dreamlike haze of faded lime green in the form of old fashioned punch, congealed salads and unidentified dips. I could remember no distinct tastes to help me identify the recipes that might have been served. All I really remembered clearly was the Lifesavor Storybook I opened as a gift and the plaster of paris plaques my aunt crafted in quantity and let us choose one from when we won one of her party games. Combine graham cracker, crumbs and ground cardamon. Add the softened butter and mix well. Press the crumbs into a 9 inch pie plate, distributing the crumbs evenly across the bottom and up the sides to form a crust. Bake for 8 - 10 minutes at 350 degrees, or until slightly browned. Remove and cool on a wire rack. Add the sweetened condensed milk and continue whisking until well combined. 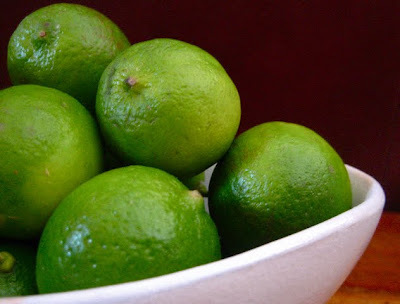 Whisk in the lime juice, half at a time, just until incorporated. Bake at 350 degrees for 10-12 minutes. Remove and let cool on a wire rack. When cool, cover and refrigerate until serving. Top with sweetened whipped cream and a pinch of cardamon or lime zest if desired. That is one fine looking pie, just wish I had brought my fork along! It's one of my favorites, thanks! Oh yes, that lovely pie of pie just creams FLORIDA!! A slice of this on a hot summers day is pure heaven. Thanks for sharing your recipe with me. 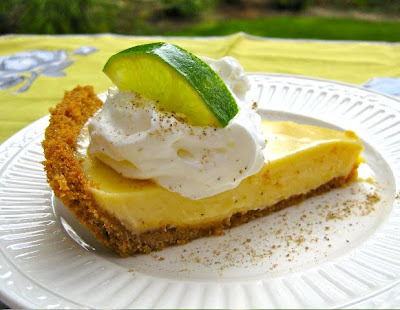 A good friend of mine absolutely adores key lime pie. I will be passing along your post to her! She'll be so excited! Your pie looks sooo delighful Lisa! It may not be as "cutting edge" but it's definitely a romantic classic in my mind.